"We understand the human mind." 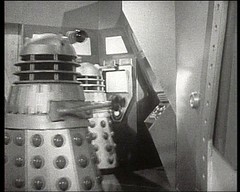 Lesterson cuts the Daleks' power reminding them that they get their power from him and seemingly regaining their obedience before reconnecting it. The Doctor & Ben go to see Bragen with their worries about Polly but he is far from helpful. A Dalek arrives to serve him drinks and they leave. However in the corridor they are passed by three more Daleks which arouses the Doctor's suspicions as there were only four in the capsule. Bragen too is slightly suspicious of the one in his office. The Daleks have requested more materials from Lesterson which worries him. He intends to seek the Examiner's advice but Janley persuades him otherwise by revealing Resno's death to him and using that as a hold over him. Ben & the Doctor arrive at the lab to enquire of Polly and to tell Lesterson about the increase in the number of Daleks, which further disturbs Lesterson and he collapses. 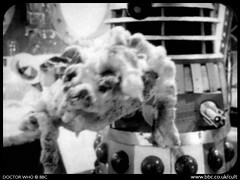 Janley throws them out but while Lesterson sleeps she summons Valmar to install another Power Cable for the Daleks. The Doctor cracks the code the rebels have been using to display messages on a public board and he & Ben lie in wait for them in Rocket Room P. The rebels, and their shadowy hidden leader, enter and watch Janley and Valmar demonstrate a fully armed but controlled Dalek to them. Ben knocks the boxes they are hiding behind over and is dragged away. When the rebel leader calls the Doctor out too, he is revealed to be Bragen. Bragen has the Doctor arrested and thrown in a cell next to Deputy Governor Quinn. The Doctor tries to use a dog whistle to trigger the sonic lock but only succeeds in aggravating the colony's dogs. 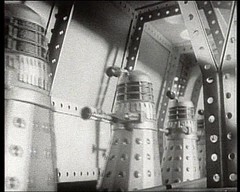 Lesterson ventures into the Daleks capsule and discovers a production line within producing many new Daleks. Fabulous stuff. The Daleks in the corridor revealing there are more of them than there should be is great. At the start we've got three disarmed Daleks, and by the end there's an army of fully armed ones. Polly is absent for this episode: kidnapped half way through the last one Anneke Wills gets a week off this week. Since Ben gets hauled off half way through this one you'd be correct in thinking that it's Michael Craze's turn for a turn for a trip to the seaside next week. The Doctor makes a lot of fuss about how the Daleks need a metal floor to move about, a limitation they had in their first few stories, all script edited by Power's writer David Whitaker. Since the Chase they've had no problem at all, generally attributed to the "power slats" that now adorn the Daleks' waist. Indeed they seem to be moving round the colony OK for the story so far. So why raise it as an issue now? And if it's become an issue how were they moving round OK before? There's the start of a short lived running joke in this episode: seeing Bragen in his office in a new uniform the Doctor comments "I would like a hat like that". The phrase crops up again in his first few stories. The Dalek Capsule represents a small mystery. Obviously there's more of it's insides seen than can possibly fit into the space shown sitting in the lab. 2 solutions exist to the problem: the capsule is the tip of the structure and the lab & colony have been built round it OR the capsule, like the Tardis and Dalek time ship, is dimensionally transcendental. Doctor Who - Lost In Time DVD contains two clips which they attribute to this episode: the first is of a a pair of Daleks and includes the quote "We are not ready yet to teach these human beings the law of the Daleks!" Turns out this is in fact from episode 5! 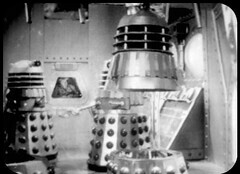 The other clip is from this episode and is a short section of the assembly line footage which was found in 1985 when Restoration Team member Steve Roberts investigated rumours some Dalek footage was shown in an Australian program entitled C for Computer. It emerges that that title is the name of an episode of a show called Perspective and that it did indeed contain Dalek footage from episodes 4 and 5 of Power of the Daleks. Steven Scott plays the rebel Kebble in the last 3 episodes of this series. He's got several appearances in The Avengers to his name. 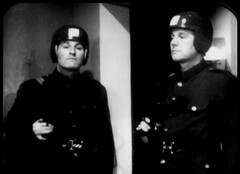 Of the guards that appear in this episode Peter Forbes-Robertson will be back as a Time Lord in Colony in Space, and the Chief Sea Devil in The Sea Devils. He's also got an appearance as Schenker in the first episode of the second series of The Tripods to his name. Robert Russell later plays the Caber in Terror of the Zygons. He'd previously been in Out of the Unknown, appearing in Thirteen to Centaurus as Sgt. Burke. 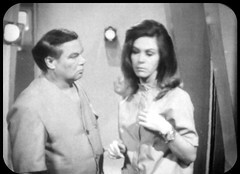 This is the same episode that features Robert James, playing Lesterson here, as Dr. Kersh and can be seen as part of the Out of the Unknown DVD set. Other genre appearance include Space: 1999: Mission of the Darians as Hadin and Blake's 7: Cygnus Alpha as Laran. It's a Dalek story so there's a few familiar names on the credits: Gerald Taylor, Kevin Manser, Robert Jewell and John Scott Martin are all back inside the Dalek shells while Peter Hawkins provides all the Dalek voices solo for the first and only time.